In the first of new serie focusing on casual conversations with some very busy people who make video games, I talked to the developers of Starfall Tactics. 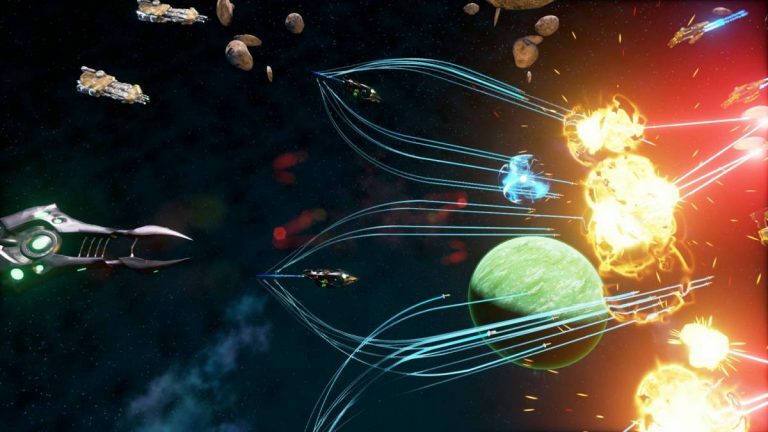 Thrusting you into space and in the middle of frenetic space warfare, Starfall Tactics is an intriguing game with RTS elements that has been receiving plenty of interest so far already. Hello and thank you – we are feeling good as Starfall Tactics becomes greater and greater every day! Tell us what Starfall Tactics is all about. Starfall Tactics is a space combat wargame with RTS mechanics where every choice matters. Tactical combat, in-depth customization and balls-to-the wall explosions will definitely touch those who love epic battles along with ability to show personal skill. Things like projectile impact, ship equipment failure, collision and so on are designed to make usual battles even more interesting and close to sci-fi reality. Where did the idea come from? Was it during a brainstorming session or a long-term project you’ve been meaning to get off the ground? Snowforged Entertainment started from choosing a project – all team members had some concepts of games they wanted to develop. So, first of all, there were several projects of different genres and monetization models. Then, after we discussed details and perspectives of all of them, the team made its choice. And we are happy with it. It’s pencilled in to come out at the end of 2016, is there still quite a way to go for you guys? Considering the size of the team, we’ve done quite a lot and are currently preparing to alpha test as it’s scheduled for this fall. We think its a pretty good result for us, but we are not going to slow down! What are some of the problems young developers should come to expect when it comes to making games? In terms of development, things are fairly stable. The main challenge we have is telling the world about Starfall Tactics and helping people pick it out of the indie-games ocean. It was easier just a few years ago, when the market wasn’t active and saturated. But we are very confident with the game experience we are making, as well as the mechanics of it, and the amount of love we put into it, so fingers crossed! Kickstarter campaign preparation also used to be one of the difficulties we experienced: making video materials, shooting our video, doing voice-overs… All these things took lots of time from our team, as everyone pitched in and had to really get out of the regular comfort and competence zones. You’ve fully embraced platforms like Kickstarter, was it always a conscious decision to find an audience there? Yes, that was a thoughtful decision and, regardless of the result, we’ve got the audience we came for. It also was an interesting experience for us and although preparing for Kickstarter was hard, this is a good method of delivering projects to the audience and getting feedback which we couldn’t miss. Which features are you most excited to show the fans? We are excited to show PVP battles along with beautiful explosions delivered via Unreal Engine 4. Thanks to our fleet editor, special mechanics and physics, you will have plenty of interesting tactical choices which can make every battle unique and exciting. Will you use suicide bombers, huge dreadnoughts, cruisers, missiles, lasers or something else? It’s all up to you to decide! We also love the Galaxy Conquest feature, as it will provide players the ability to determine the fate of the whole galaxy! You will travel and explore the confines of known space taking part in a variety of activities as well as participating in clan conflicts in Outer Space. And finally, why should we be keeping an eye on Starfall Tactics? Whether you want to treat Starfall Tactics as a session-based game with quick matches, run a few solo PvE missions or join a clan and fight other players for territory, the game should cater to all these choices. So, if you are looking for a memorable game experience, love sci-fi and ready to show your true skill in a unique blend of RTS&Wargame, be sure to visit the Starfall Tactics website and play as it gets to Early Access on Steam!